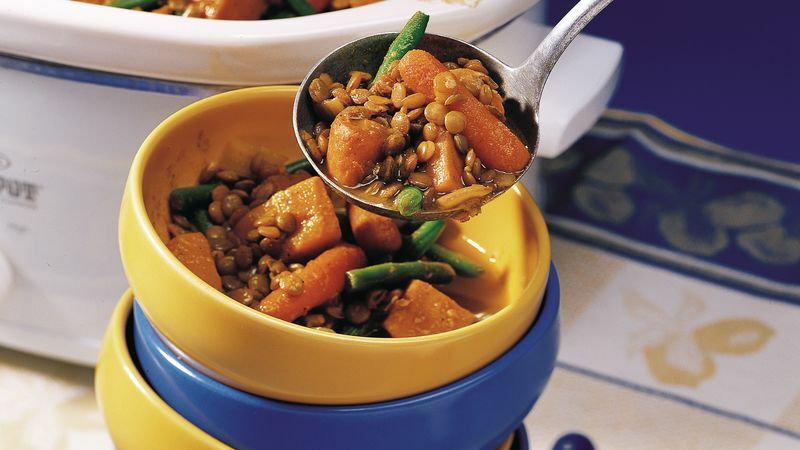 In 3- to 4-quart slow cooker, mix sweet potatoes, onion, carrots and lentils. In 8-inch skillet, heat oil over medium heat. Add curry powder, cumin, salt, pepper, gingerroot and garlic; cook 1 minute, stirring constantly. Stir in broth. Pour mixture into slow cooker; stir. Increase heat setting to High. Stir in green beans. Cover; cook about 15 minutes longer or until green beans are crisp-tender. Serve topped with yogurt. Cooking the spices together before they are added to the wonderful ingredients gives this curry its wonderful flavor. Lentil stew keeps well in the refrigerator for up to 4 days. You can also freeze it in airtight containers for up to 3 months. Place the green beans in the refrigerator when beginning the recipe, and they will be thawed just in time to stir into the stew.